The fine editors of Journal of Unlikely published an interview with me yesterday. In one of those delightful turns that shakes up the protocol a bit, they asked me if I had questions for them, and I did, and I asked them, and they answered. So this is a bit of a two-way interview, a rare category of interview of which I think there ought to be more. The e-book of the brand new anthology 2015 Young Explorer's Adventure Guide is now available on Amazon. The anthology, edited by Corie and Sean Weaver, contains my story "Repeat After Me", and has a really cool lineup of authors, including Nancy Kress, Deborah Walker, Eric James Stone and Eric Del Carlo. Excited to be in this one! Physical editions of the book should be coming soon, too. SF superstar Mike Resnick, and each volume teams up an established, big-name author with an emerging author of their choice in back-to-back novellas. Alvaro Zinos-Amaro (author of the second, concluding novella) does a fantastic job of matching and resolving Silverberg's initial piece in style and tone, and shows himself fully in control of the wild plot elements which Silverberg has thrown out there in the first novella. The extraordinary thing about these paired novellas--which between them form a complete story--is the narrative voice. Exuberant, bardic, improbable, tongue-in-cheek, filled with narrative asides and hilarious digressions, it brings faint echoes of Douglas Adams, Spinrad, Zelazny, and even Vonnegut at their wildest, and yet is wholly original; there are similarities to Fred Pohl's "Day Million", but without the latter's urgent, harsh edge (some readers might even invoke Farmer/Trout's infamous "Venus on the Half-Shell"); there is worldbuilding to make your head spin; there is hard science; and there is, at the heart of it all, a very Silverbergian love story." Incidentally, I think this makes Dario the first to pick up on the Pohl tribute/homage in the story. 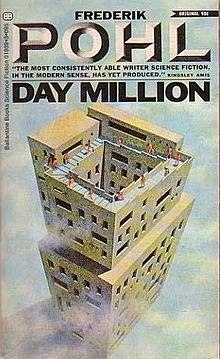 In fact, "Day Million" was one of my original working titles for a sub-section of my novella, which I eventually changed to something else that seemed more appropriate.